Imagine the following: You're a girl who's been bullied for three years by a boy and his friends. You starve yourself because they call you fat and ugly. As an adult, you've transformed into a fairly attractive person and run into the bully, who then asks you out. What would you do? Louisa Manning went for revenge. While some will still say that only sticks and stones break bones, many of us know that words are often much more cruel than physical pain. So when an opportunity to exact some kind of fitting revenge on a person who's made your life miserable presents itself, isn't it okay to take it? Especially if it involves only a note and a photo? When a former bully reached out to Manning and asked her to have dinner with him–presumably because he wanted to be friends, but also probably because she is attractive now—she agreed. But she didn't show up. What awaited her tormentor was an empty table and a note passed on by a waiter. A note that made it clear how badly the bully had hurt Louise. And a picture to remind him of what Louisa had looked like when he was calling her a manbeast. 'Hey, so sorry I can't join you tonight. 'Remember year 8, when I was fat and you made fun of my weight? No? I do – I spent the following three years eating less than an apple a day. So I've decided to skip dinner. 'Remember the monobrow you mocked? The hairy legs you were disgusted by? 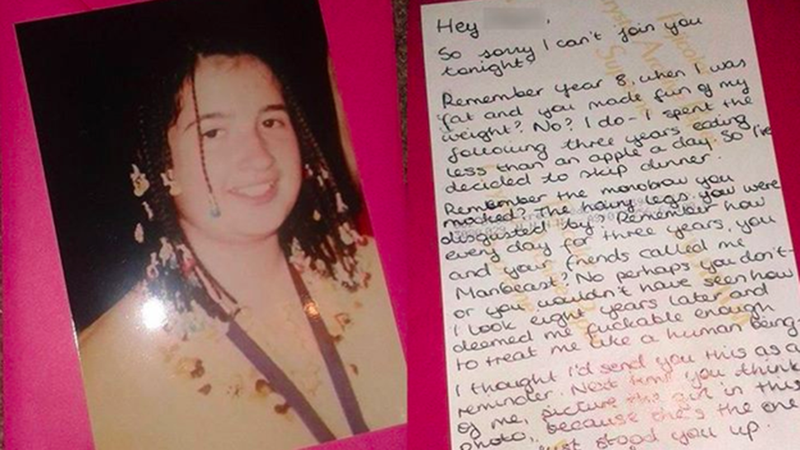 'Remember how every day for three years, you and your friends called me Manbeast? 'No perhaps you don't – or you wouldn't have seen how I look eight years later and deemed me f***able enough to treat me like a human being. 'I thought I'd send you this as a reminder. 'Next time you think of me, picture that girl in this photo, because she's the one who just stood you up. While some people are suggesting that what Manning did was stupid, self-serving and a sign of the fact that she thinks way too much of herself, it's also a good example of how lasting the damage that teenagers inflict on each other can be. And the reality of the situation is that being stood up, while inconvenient and somewhat embarrassing, is only a fraction of the humiliation Manning must have felt all those years. Manning's bully (unnamed) sent her a message in reply to the note, apologizing and saying he had only been interested in being friends (::sideeye::) anyway. 'Hey… For what it's worth, I was actually here to meet up looking for a chance to meet up looking to make friends, not because you are very good looking. 'I guess I had it coming though, and certainly don't blame you for standing me up. 'I can't change who I was 8 years ago, and I won't insult your intelligence by pretending that it didn't happen, but I hope you believe me when I say I'm a completely different person now. Which: Fine, great. At least he apologized and said he was a different person. But perhaps their interaction should have started with that apology, one that it seems clear Manning, like many other formerly bullied kids, had really needed to hear. "I'm so shocked, I actually got an apology," she said. "It's 10 years too late and really if he'd intended to apologise he should have done so when I bumped into him last weekend rather than asking me out for dinner first, but it's still an apology and it's still amazing I got one."